As the days get shorter and chillier, Christmas has come around again with its promise of good food and treats. It’s also the time of year that strikes fear into the heart of any vegan’s relative: What to cook them?! Fortunately for me, this was never a problem in our house as my whole family were vegetarian. 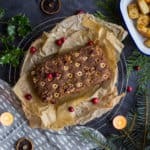 This meant we always ate a variation of this Classic Vegan Nut Roast for Christmas Dinner. To be honest I’ve never understood why nut roast gets such a bad reputation – it’s delicious, nutritious and protein-packed! It’s really not a poor substitute for meat – it’s just totally different. For anyone unfamiliar, a nut roast is basically a delicious savoury loaf made with nuts, seeds, herbs, spices and vegetables. It forms the main part of a roast dinner, and can be served with any of the following; roast potatoes, carrots, parsnips, gravy, cranberry sauce, brussels sprouts, salad and greens. It’s incredibly filling as it’s so protein-dense, and is really delicious. It’s no exaggeration to say that a roast dinner featuring a nut roast is my all-time favourite meal! 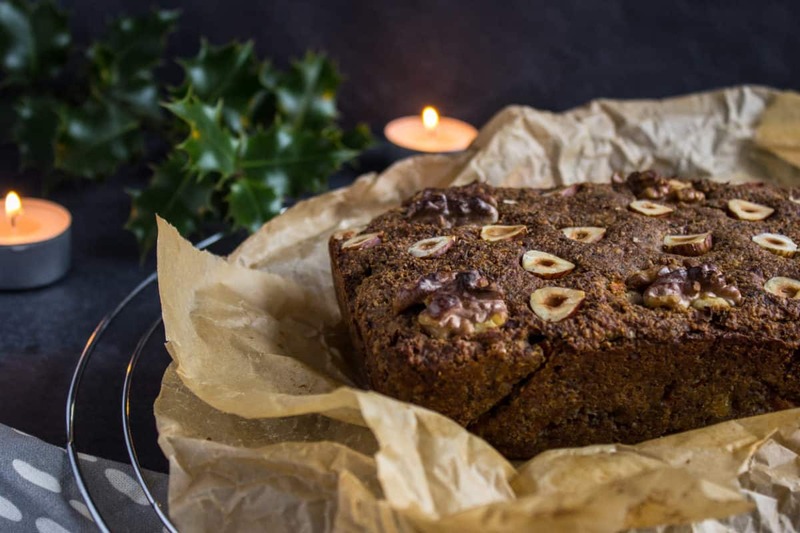 This Classic Vegan Nut Roast (which is also gluten-free) is a delicious combination of hazelnuts, peanuts, walnuts and sunflower seeds, but if any of these don’t suit you, you’re welcome to substitute them for other nuts/seeds. I’ve used this combination specifically because it’s delicious and cost-effective (the peanuts and sunflower seeds help to bring the price down), but it’s totally customisable to your own tastes. 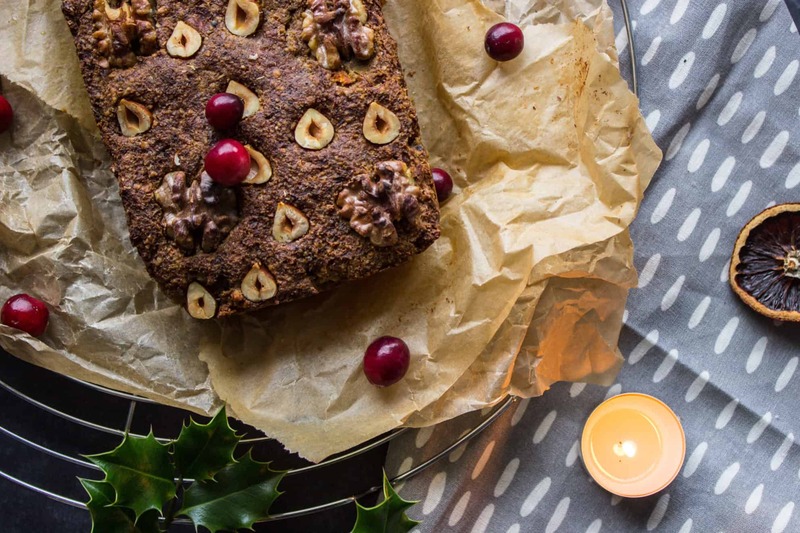 Get creative and enjoy – and I hope you find nut roast as delicious as I do! 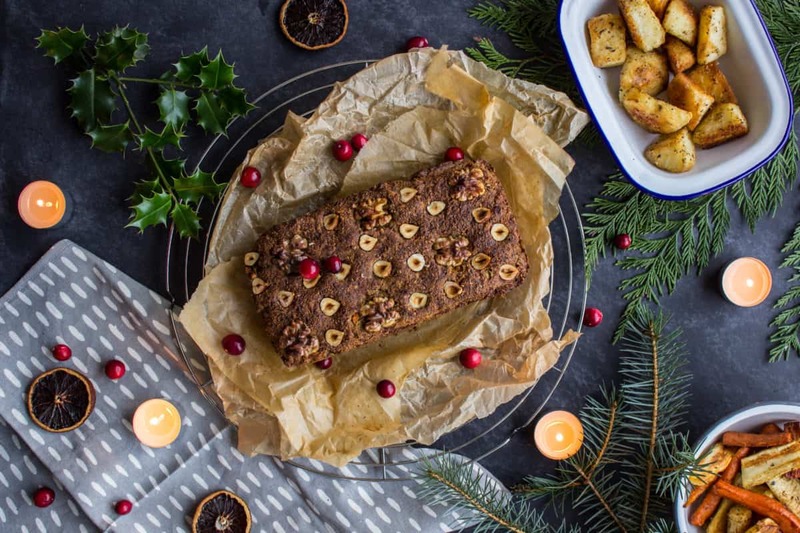 For anyone cooking a meat-free Christmas Dinner, this Classic Vegan Nut Roast is delicious, filling and will be the perfect main dish! Preheat the oven to 175°C/350°F and line a loaf tin with baking parchment. Mix the ground flax and water together in a small bowl and set aside. Add the peanuts, walnuts, hazelnuts and sunflower seeds to a blender or food processor and blend until they become coarse flour. Transfer to a large mixing bowl and add the mixed herbs, sage, pepper and brown rice flour, and stir until combined. Chop the onion, carrot and celery into four large chunks each. Place them all in a blender or food processor and blend until they are finely chopped. Add the olive oil to a saucepan and heat. Add the onion, carrot and celery and fry the mixture gently for about 10 minutes, until the vegetables are softened and fragrant. Transfer the vegetables to the large mixing bowl with the dry ingredients, add the flax egg and tamari, and mix everything together really well. Season to taste with sea salt (I would sample the mixture at this point before adding salt as soy sauces tend to vary in their saltiness, and you may not need to add any extra!). Pour the mixture into your loaf tin and press it down to flatten it with a spatula. Press the ¼ cup of nuts your reserved for decoration into the top of the roast, placing them evenly all over the surface. Bake the roast in the oven for approximately 45 minutes, until the top of the loaf is browned. Remove from the loaf tin and place on a cooling rack for 30 minutes - or serve immediately! Serve with roast potatoes, parsnips, carrots, kale and gravy. Looking for more vegan-friendly Christmas recipes? Try my Rosemary & Sage Hasselback Potatoes, Roasted Maple Rosemary Carrots, Festive Mince Pies and Wholesome Holiday Cookies!